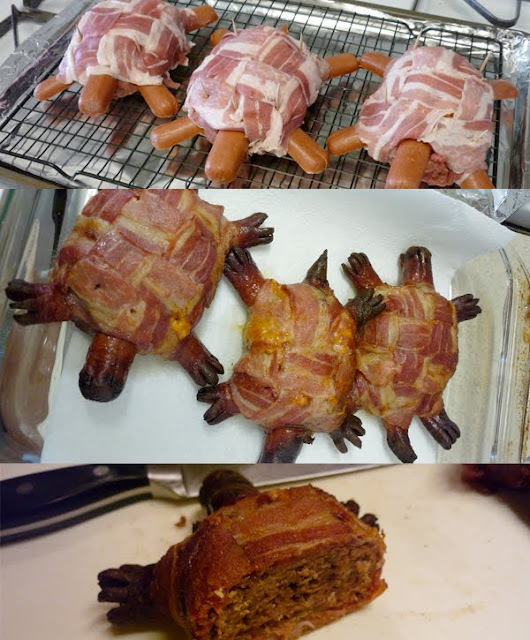 Mmmmmmm bacon............... this is a heart attack waiting to happen. Handmade ground beef patties, topped with sharp cheddar cheese, wrapped in a bacon weave. Then the next step, add hotdogs as the heads, legs and tail. Place on an oven rack, covered loosely with foil and baked for 20-30 minutes at 400 degrees. A little crispy, not too crunchy...just how a turtle should be, no?